IT Carlow claimed their first Purcell win after an eight point victory over fierce rivals St.Pat’s Drumcondra in IT Carlow last Wednesday night. Playing in horrendous conditions of sleet and rain, the repeat of the 2015 Fr.Meachair semi-final proved to be extremely skilful and entertaining despite the weather conditions. St.Pat’s dominated the opening 10 minutes with IT Carlow hitting 6 wides to find themselves behind against the wind. Georgina Kelly got IT Carlow off the mark with an early free but the combination of Aisling Nolan and Lisa O’Neill up the centre of the St.Pat’s attack was a difficult task for the IT Carlow defence. O’Neill answered Kelly’s point and quickly pushed her side ahead when she found Nolan for the pop pass to make it 0-2 to 0-1 with five minutes played. Kelly then pointed again for IT Carlow but a Lisa O’Neill free kept her side ticking over as IT Carlow racked up the wide count. An unexpected IT Carlow goal seen the home side lead for the first time as Kate Nolan intercepted a side-line pass to flick off the hurl to centre forward Siobhan Flannery who somehow managed to find the net from 40 yards out. Cork native Finola Neville then added to this lead turning and twisting past two St.Pat’s defenders before eventually finding space to point off the hurl on her left. This didn’t dampen the spirits of the Dublin side as O’Neill popped over a final free before the break to punish IT Carlow fouling and trail by two points. 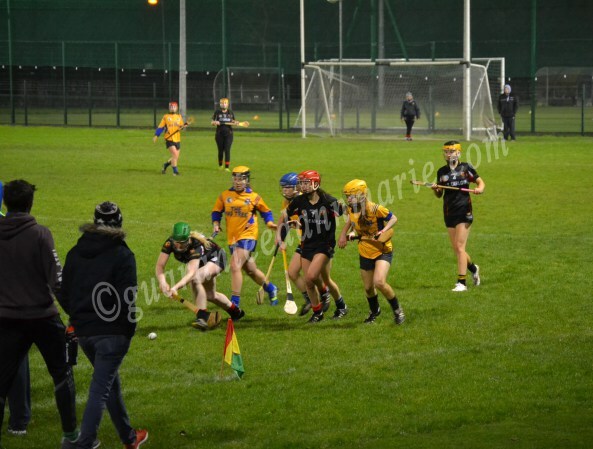 As the weather worsened on the bitterly cold night in IT Carlow, both teams returned to the pitch hungry for their first championship win. A very determined Pat’s side set the pace very quickly found the net as dangerous corner forward Paula Farrell blasted the ball to the net with under a minute played from the restart. A placed ball point from the ever accurate Lisa O’Neill edged her side in front with a one point lead. Awakened by the St.Pat’s quick attack IT Carlow found another gear to retain their lead on home turf. Two Georgina Kelly points narrowed St.Pat’s lead as centre back Edwina Keane hit a massive long range score along with the help of a strong gale to give IT Carlow a single point lead mid-way through the half. 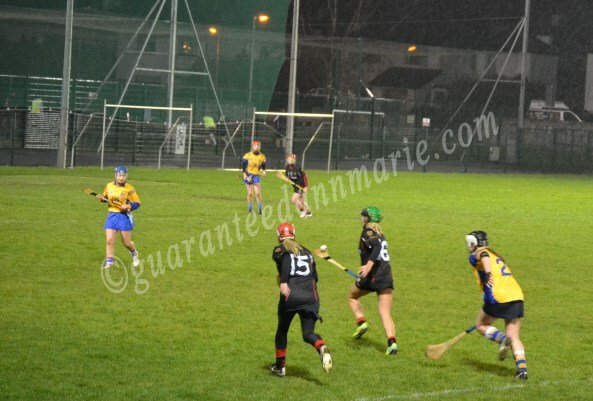 St. Pat’s continued to fight winning a lot of possession around mid-field and almost had a goal when Ailsing Cremin helped keeper Emma Walsh to stop a Pat’s attack. The unstoppable Siobhan Flannery hit four points before the final whistle as Kate Egan was always on hand to find the number 11 in a scoring position. A final Georgina Kelly point meant IT Carlow gained revenge on St.Pat’s league win earlier in the year with an eight point victory in IT Carlow. Institute of Technology Carlow: Emma Walsh, Aisling Cremin, Nadina Grace, Nicola Byrne, Niamh Cavanan, Edwina Keane, Aoife Heffernan, Denise Deering, Kate Egan, Georgina Kelly, Siobhan Flannery, Megan O’Reegan, Katie Nolan, Finola Neville, Aoife Murphy. Moment of the match: St.Pat’s goal turned IT Carlow’s lead right around and set the pace for a fast second half. Had they added to this goal the game easily could have went in their favour. Score of the match: The build up for Siobhan Flannery’s goal early in the first half was immense. Corner forward Kate Nolan found herself almost at the mid-field mark to defend a sideline ball. The number 15 intercepted the sideline took the ball on the hurl and without catching found Siobhan Flannery who turned onto her right and managed to raise the green flag from 40 meters out. This entry was posted in Archive, News and tagged CCAO, CCAO 2016, IT Carlow, Purcell Cup 2016, ST.Pats by CCAO PRO. Bookmark the permalink.